On Nov. 20, 1982, California shocked Stanford on a last-second miracle that is remembered to this day as one of the most iconic moments in college football history. After Stanford kicked a last-minute field goal to go up 20-19, Cal returned a kickoff for a touchdown with time expiring on a play that involved five lateral passes, an errant trombonist and enough mayhem to last a lifetime. 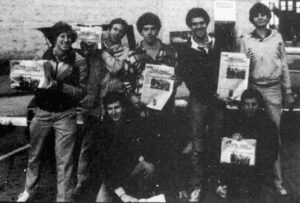 Although Cal won the game, one of the lasting memories from the ordeal was a fake issue of The Daily Californian, Cal’s student newspaper, that members of The Stanford Daily staff published four days following the game. The issue fictitiously proclaimed that the NCAA had reviewed the final play, and invoked the a made-up “Rule 55, Section C” that allowed it to overturn the referees’ decision and award Stanford the victory. After distributing copies of this fake issue on Cal’s campus, chaos broke out as a large portion of the Berkeley community fell for the hoax. Meanwhile, as news of the prank made its way back to Stanford, Cardinal students shared in a much-needed moment of comic relief as they tried to get over the heartbreaking loss. For their intricate and far-reaching work, these Daily staffers are now remembered for pulling off one of the most famous college pranks of all time. A once-promising season had turned sour for the 5-5 Cardinal, as the team entered the Big Game losers of four of their last six. Nevertheless, a win in the final game of the season at Cal would give Stanford bowl eligibility for the first time in four years. Tony Kelly ’86, entertainment editor: We weren’t used to having a good football team. Every Saturday, you would go and see [quarterback John] Elway do things that no one else could do on a football field, but we wouldn’t really win that much. Ivan Maisel ’81, former sports editor: They were still in contention for a bowl game when they got to Berkeley. All the bowl games wanted John Elway because it was John Elway, and everyone knew he would be the first pick in the draft. In the 85th Big Game, 5-5 Stanford faced off against 6-4 Cal, which was led by first-year coach and former Cal star quarterback Joe Kapp. Mark Zeigler ’85, writer: It was always played near the end of the season, and Stanford and Cal back then were never any good… This game has no [major] implications, but to me that made it even bigger because that was basically your bowl game. Basically the entire student body went and the student section was packed. Down 19-17 late in the fourth quarter, Elway lined up under center at Stanford’s own 13-yard line. A miraculous fourth-and-17 conversion and a big run from Dotterer helped set up kicker Mark Harmon for 35-yard field goal with eight seconds on the clock. The kick was good, and Stanford took a 20-19 lead with four seconds to go. Todd Davies ‘85: I’m looking at the backfield and Elway about to take the snap, and I remember he kind of knelt down, and I thought that was kind of an interesting moment of, like, either praying or reflection or thinking about the task that was ahead. And then he orchestrated this drive that eventually led them to score and it was amazing. Zeigler: That fourth-and-17 completion that Elway made, I think he would admit was one of the best passes he threw in college and maybe in his career. Maisel: [Stanford head coach Paul] Wiggin called timeout with eight seconds left, and I remember thinking, “Wow, that’s a lot of time.” But we kick the field goal and we’re up by a point, what could go wrong? After the go-ahead field goal, Stanford incurred an unsportsmanlike conduct penalty and had to kick off from its own 25-yard line instead of the 40. From there, Harmon squibbed a kick to the Cal 45, picked up by Cal safety Kevin Moen. What followed was a seemingly endless cascade of lateral passes by Cal returners trying to keep the play alive. When a Cal player appeared to go down by contact, Stanford band members and students began to rush onto the field, but the play continued to unfold. The Cal lateral train managed to get the ball back to Moen at around the 25-yard line. With no defenders left to catch him and a barrage of fans to weave through, Moen charged at full speed toward the end zone, running over Tyrrell as he spiked the ball in celebration. Gary Tyrrell ‘83: With about two minutes left in the game, that’s when we started heading down to do our postgame concert. That’s why we found ourselves in the back of the end zone in that corner of the stadium while the game was still happening. Out of the corner of my eye, I see this Cal player running towards the end zone and I figured he just wanted to get the hell out of here because there’s chaos going on around him. Then I realized, “Oh, he has the ball,” and the next thing I know, I was down. Maisel: The officials congregated at midfield, and the longer they met, the more my stomach began to sink. If they’re meeting that long, it wasn’t a good sign. The referee signaled touchdown and Stanford people continued to celebrate because they weren’t paying much attention. Mike Dotterer ‘84: I felt like I was an actor on stage. The whole thing was like a Shakespearean play. Zeigler: Growing up playing a lot of pickup games in the neighborhood on the street, someone would always say “Last drive, winner takes all,” and then some kid would score and the other team would be like, “No no no, we want one more play,” and that’s kind of what it felt like. The contingent of Stanford fans was convinced that the referees had gotten the ruling wrong. Adam Berns ‘84: There’s no doubt, and I’ve looked at it many many times on YouTube, that that last lateral was a forward lateral. Davies: “Oh my God, we’ve been robbed.” I mean, you know, they said we won the game. The play was ruled dead, and we should have won the game. And now because we’re at Cal and all the fans stormed the field, they ruled the other way. Kelly: You don’t live or die with the football team, but it was close, and it was Cal, and it was Big Game, and the last game that Elway was going to play for us. It was a heavy mood in the way that sports can cause a heavy mood for a period of time. With a sense of gloom surrounding the Stanford student body, a group of Stanford Daily staffers saw an opportunity to brighten people’s spirits and needle Cal in the process. Berns: I really thought that Stanford campus needed something, some kind of revenge for what had actually happened. [The idea for the Fake Daily Cal issue] came to me while I was at the Sunday Flicks, where they would put on a movie at Memorial Auditorium on Sunday evening. Sunday night, it popped in my mind that it would be a brilliant idea to do a fake paper after the game that basically said that the NCAA had given the Big Game back to Stanford. Zeigler: Adam had to convince me, since I had a lot of stories to write and a lot of schoolwork that week. He said, “Look, in 20 years when we’re sitting on my Greek yacht, you’re not going to remember the tests you missed — you’re going to remember this paper,” and that was what convinced me. I don’t know where he came up with the Greek yacht, but it hasn’t happened and I’m waiting for my invitation [laughs]. After getting the go-ahead from the the EIC and business manager, the small team got to work assembling the entire newspaper from scratch in the span of two days. 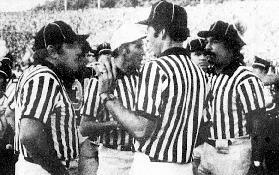 Berns: This was pre-Photoshop, so we had the photo managing editor doctor a photo of the ref calling the play dead. We had a state-of-the-art computer system at The Daily where we could change the type space and things like that, and we had copies of the Berkeley paper so we made it look exactly like the Daily Cal paper down to everything. In really really small type we wrote that it was a Stanford Daily prank, but it was in such small type that you could barely read it. Kelly: Mark wrote the most brilliant article that’s in there, which is the interview with Joe Kapp, who was always the kind of coach where one cliche would never be enough. Making up quotes for him like, “Life isn’t fair, I just swear to God it isn’t,” just sounded so perfect and so hilarious for that article in that time. Zeigler: It was a lot of work since we had to put together literally an entire paper, and we didn’t end up sleeping two nights in a row. The story I wrote about Joe Kapp, I wrote in about 45 minutes at four in the morning. I’m not sure it would have come out that good if I’d had my senses about me. Mulvoy: I asked if I could take a crack at the lead story — I’d done some sports coverage for [The Boston Globe], so the flow of such a story wouldn’t be a problem, especially if we were going to make it up anyway. Off the top of my head, I made up Rule 55, Section C — took me five minutes. Berns: We had seen some current event topics in columns in the [real] Berkeley paper, so we wrote humorous topical letters to the editor in the fake paper. We put some fake ads in there. I can’t believe we actually did this — I’m a lawyer by training and I look back at this and laugh and think, “Oh my God, are you kidding me, we could have gotten in such trouble” — but we put in a 2-for-1 ad from the Berkeley bookstore [laughs]. Berns: The only people that knew about the paper were the EIC and business manager, me and Mark, the graduate fellow, the photo editor and the guy that laid it out. Everybody was told to say nothing about it. After hours of frantic work to put together the fake issue, the group of Daily staffers drove up to Berkeley Wednesday morning to distribute the newspaper. Kelly: I had a car at the time that had a Cal Berkeley sticker on it, and that made a lot of difference. I was the one that would end up transporting the issue to campus, because it was a car that wouldn’t be noticed on the campus, because it had a bear sticker on the window. Berns: That morning, at 5 or 6 a.m., we took off with around 15,000 copies of the fake paper to drop off all over campus and in the Berkeley dorms. We got unbelievably lucky in that the Cal paper was coming out with a special double issue before the Thanksgiving holiday, and they ran into printing problems, which we had nothing to do with. Complete and utter luck. The Berkeley paper was eight hours late the day we ended up going up there with the fake Daily Cal, so we were the only paper on the campus. Zeigler: I had this blue and yellow sweatsuit, and after I got into Stanford, I was like, “I can’t wear this,” so it had been sitting in the back of my closet, but that day, it came in handy. After distributing copies of the paper across campus, the Daily staffers stuck around to observe the reactions of the Berkeley community. Zeigler: We’d drop off a stack innocently and then wait 50 yards away, just to see what people’s reactions were. We saw a cheerleader cry, and a football player stop in his tracks and sit down. Eventually people would figure it out, but it took them a while. Kelly: There was this spectacle of the publisher of the Daily Cal collecting armloads of the paper just saying, “What the hell is this?” Meanwhile, people are taking copies of the paper from him while he’s complaining about it. Berns: [In the fake issue] we had called for an all-campus rally to protest the NCAA, and something like 1,000 people showed up to this fake rally. Zeigler: People relied on the newspaper to know what was happening, and in a sense we abused that trust, but it’s also a college prank against a rival, so we didn’t really care [laughs]. It was the ultimate example of fake news. The buzz didn’t end at Berkeley. Upon returning to campus, The Daily was hounded by phone calls from media outlets across the country. Kelly: By the time we got back The Stanford Daily office that day, somebody had tipped off someone in the media, so there were all these radio stations and TV networks calling and it was Richard and the sports editors who had to handle all of that. Richard Klinger ’83, Editor-in-Chief: The best phone call was from an adult at Cal, someone on the board of the Daily Cal, or their faculty advisor, but he was threatening to sue us. He was very upset, and said we’d done the paper wrong. My attitude was to let him blow off steam, but I was thinking, “We’re happy to make this a bigger public matter if you want to do that” [laughs]. Berns: I was shocked. I normally watched NFL Today because I was a big pro football fan. I was literally just watching it, and Musberger held up a copy — I don’t know where he got it — and he starts reading the Joe Kapp story, with the “Life isn’t fair. I swear to god it isn’t” quote. I almost fell out of my seat. Davies: The fact that [Cal fans] could see how we felt in some sense, I thought there was justice in that and that it was an effective way to convey — I thought it was a clever thing at the time. As a whole, the 1982 Big Game is remembered as one of the most absurd moments in the history of the sport. Maisel: The Play was the original. It still stands as the craziest finish to a college football game in the history of the sport. Anytime a crazy play happens now, people compare it to The Play. The prank was wonderfully and artfully done. It just added to the lore. Berns: Back in my first year of law school at UCLA, I ended up working for a federal district judge, and I remember I had put the [fake] paper on my resume at the very bottom, and this federal judge happened to be an enormously huge Stanford football fan. When she read this thing, all she wanted to talk about in my interview was the fake Daily Cal. Obviously I got the job [laughs]. Dotterer: What they [The Daily staff] did was so ingenious. I would have loved to have one of these iPhones with a camera taking pictures of Cal students reading that paper. It took a lot of the sting out of it for people that loved Stanford football. Klinger: It was well-received on campus, and that was the principal reason we’d done it, other than just a sense of justice and aggrievement. Mulvoy: It was terrific journalism, and nothing to do with being on the college level. They did as well as any major newspaper would have done, and it did what it was supposed to do. Contact Sandip Srinivas at sandips ‘at’ stanford.edu and Neel Ramachandran at neelr ‘at’ stanford.edu.